Alcatel has been relatively quiet in the past couple of years. Although we know that the company’s still alive and kicking from the release of a few handsets, it did not make waves in the mobile phone scene, not even a ripple. With the new products from the company, though, it appears that Alcatel is trying its best to be somehow relevant, if not anywhere in the world, at least in the Philippines. I had the chance to review the Alcatel Blaze Glory 918N Android phone and I was genuinely surprised at how good the phone is considering its price. The Alcatel Blaze Glory 918N is a budget phone with a P5,990 price tag and at this price level, it competes directly with the Samsung Galaxy Y. 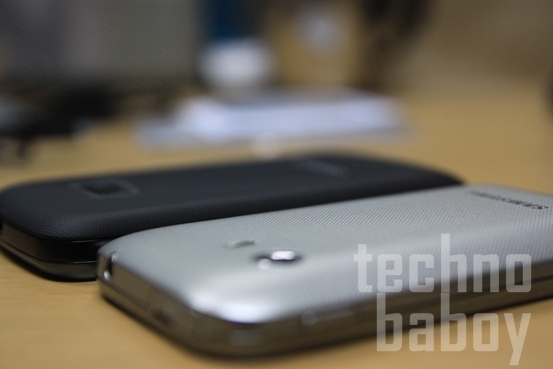 How does the Alcatel fare against its closest competition? Read on to find out. The Alcatel Blaze Glory 918N is one solid phone. The materials used are sturdy and you feel a little heft when you hold it in your hand. The unit I reviewed has the aubergine color, which is simply differentiated from the black version by silver accents and a brownish back cover. Between the aubergine version and the black version, I like the latter better. 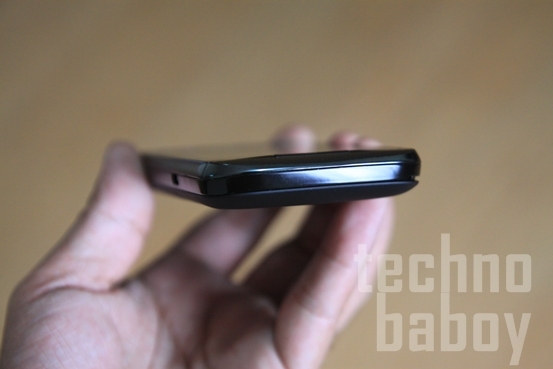 The Alcatel Blaze Glory 918N has piano black side trimming while the back cover has a rubbery finish that prevents the phone from accidentally slipping from your hand. The bottom front of the phone hosts three capacitive buttons which are Menu, Search and Back buttons, and below them is the physical, clickable Home button. On the right side are the volume rocker and the power button, while on the left side is the micro USB slot for charging and connecting to PC. 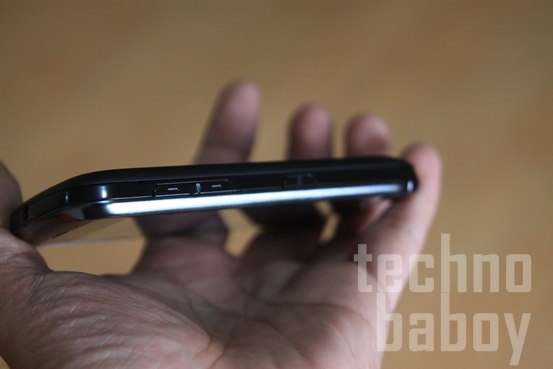 At the top of the phone is the 3.5mm earphone slot, while at the back are the camera and the speaker grille. The Blaze Glory 918N sports a 650MHz processor but believe me, it doesn’t feel slow. It has a 3 megapixel back camera but sadly it doesn’t have flash. It also doesn’t have a front camera. But for the price of this handset, I can manage without the flash or the front-facing camera. In terms of connectivity options, Alcatel did not skimp. It has 3G and Wi-Fi connectivity, Bluetooth 3.0 with A2DP, and even HSPA. A2DP in Bluetooth is a nice feature as it allows you to use a Bluetooth headset for audio playback. One of the star features of the Blaze Glory 918N is arguably the screen. The screen of this handset is sharp considering the price, and honestly, it’s as sharp as the screen on the Smart Netphone 701. The colors are nice too and it has decent viewing angles. The difference in display quality between the Alcatel Blaze Glory 918N and the Samsung Galaxy Y is huge. The Blaze Glory features a 3.2-inch screen with 320×480 pixel resolution, while the Galaxy Y has a 3-inch screen with a lower 240×320 pixel resolution. While I was frustrated with the screen of the Galaxy Y, I was surprised at how good the screen of the Blaze Glory is. It’s sharper, has better color reproduction, and has better viewing angles. If the screen on the Galaxy Y sort of kills the user experience, the Blaze Glory’s screen enhances it. 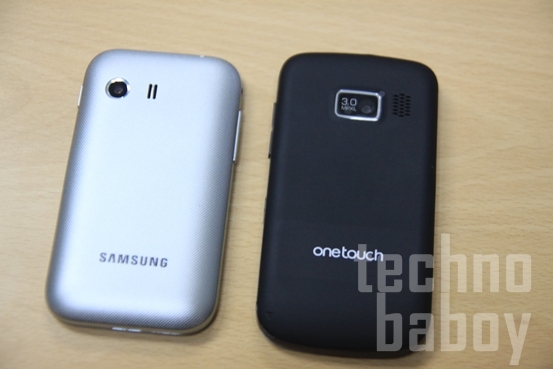 Here is the Alcatel Blaze Glory 918N beside the Samsung Galaxy Y. 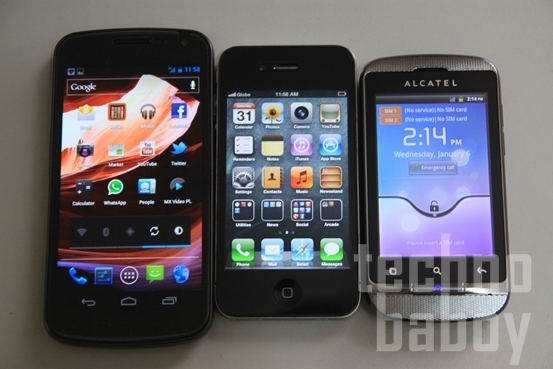 And here is the Blaze Glory beside an iPhone 4 and a Samsung Galaxy Nexus. 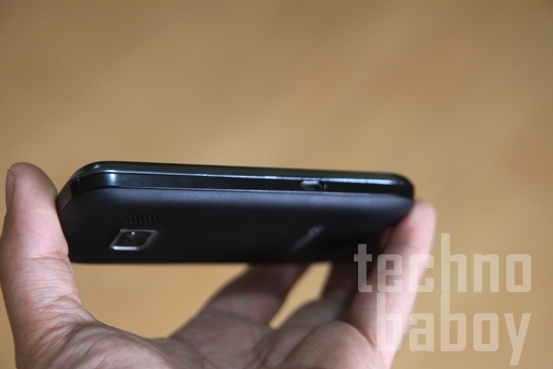 Of course the other thing that sets the Blaze Glory apart is the dual-SIM, dual standby feature. For the price of this handset, a dual-SIM functionality is a really just a bonus. The dual-SIM feature works well on this phone and I expect users with multiple SIMs to find this highly useful. Compared with the Samsung Galaxy Y, the Blaze Glory 918N feels snappier and faster. The slower performance of the Galaxy Y could be blamed on the TouchWiz skin, but I can’t be really sure. In my experience using both phones, I was more satisfied with the Alcatel Blaze Glory 918N. The screen is more responsive and the apps load faster. Don’t expect a smooth experience on graphics-heavy apps though as sometimes the screen stutters. But for basic games and applications, the Blaze Glory is quick and responsive. The battery life of the Blaze Glory 918N will suffice if you are not big on browsing or playing multimedia. If you regularly do these stuff though, the phone’s 1300 mAh battery will not last you the whole day. But if you only browse occasionally and play some MP3s or maybe short videos, the battery will get you a little farther. The Blaze Glory has a decent camera. 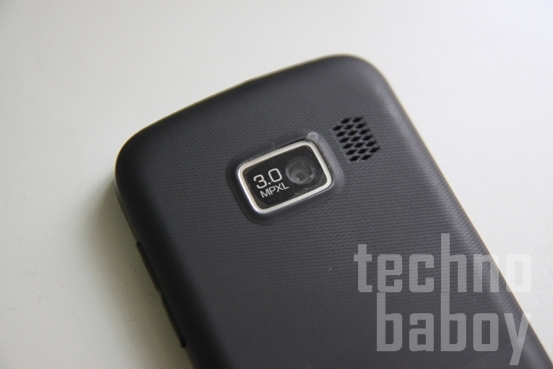 Its 3-megapixel sensor is much better than the 2-megapixel sensor on the Galaxy Y. On the Galaxy Y you get practically useless shots with ultra-low contrast and low sharpness level. Photos taken by the Blaze Glory are much better and just right for the price range. I will update this post with sample shots from the Blaze Glory. 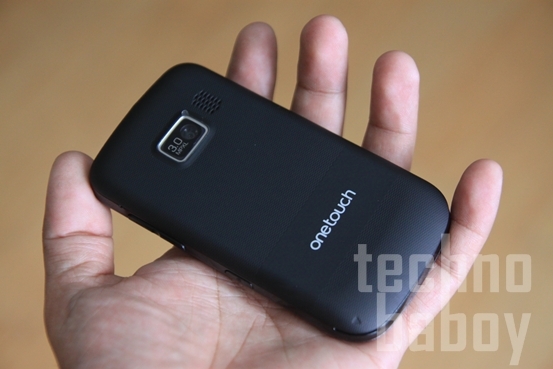 The Alcatel Blaze Glory 918N is a bang for buck handset. It’s retails at only P5,990 but for this price you get a nice 3.2-inch screen, dual-SIM functionality, 3G and HSPA, a 3 megapixel camera, Bluetooth 3.0 with A2DP, and of course Android 2.3 Gingerbread. You normally don’t get these features on an Android phone with this price. The phone’s solid construction belies this phone’s price and if there’s any trade-off I see, it’s the 650MHz processor, which I don’t find insufficient. In terms of performance, this processor surprisingly gives you a snappy interface and a decent speed in loading and using apps. Considering that the Alcatel Blaze Glory 918N has the same price as the Samsung Galaxy Y, it’s but natural to compare the two handsets. I was able to use both and there’s no doubt in my mind that the Blaze Glory easily wins over the Galaxy Y. The display is the main point of comparison and its where the Galaxy Y falters and the Blaze Glory shines. The Blaze Glory also leads the Galaxy Y in terms of overall features, and although the Blaze Glory has a slower processor, it’s not slower in performance. If camera quality is important to you, the Blaze Glory delivers better photos so there’s no contest when it comes to this. too many pattern attempts.. hinahanapan ako ng ng username at password,, ienter ko ayaw naman..pls. help..
pano i.off ung shutter sound sa camera? tapos ilipat mo sa /sd. kung ibabalik mo ang shutter sound, ilipat mo unlit mula sa /sd. Can any dude share to us if this unit has a built-in equalizer? example… equalizer settings like rock, base, classical, jazz, flat, heavy base…etc. Has anyone tried here an mp3 with its album art? Does it work dude? maganda itong phone na ito. i got mine. free sa suncellular. hi po as ko lng pano i root itong alcatel?d po b mavo void ang warranty?nkasun postpaid po ako,kc tlgang d mkpag dl at ma store s sd card mga apps…pls help,thanx..
Don’t ever buy alcatel products after sales here in the philippines is very poor. Is this phone, viber compatible? d pala 3g phone ng alcatel..walang dual cam..
wag mo gamitin ung postpaid sim mo kasi bka kala mo nka wifi ka un pla nachacharge n seo.. use other SUN sim(prepaid) then text ACTIVATE 2300 after 24-48 hours activated n internet mo pwde k ng makaconnect sa wifi..
ang sabi hindi daw maconfigure yun handset at pinatatawag ako sa 200. kapag dial namn yun 200 ayaw mag connect?!!! is it really onsale? i want to buy today. set the date and time properly..
go to file manager>music>(choose the music you want then long press)click share>bluetooth. that’s it. Same issue. How can I disable the shutter sound? eto po para mas makatulong di kasi sumasagot admin eh. pinadalhan ako ng mismong customer service ng email with link ng user manual ng alcatel glory. idownload nyo nlng po. my friend, i have a new alcatel glory, i wish if you could help me. Have a problem in deleting some contact in the list, can you give me the solution?. In making a message in tx box it appeared color green and with underline will not print the word you want to enter. Hope you can help me what to do? Just dl silent camera from google play . I think my problem is related to this one, I had 8gb sd card but everytime I download apps it says insufficient sd card but when I checked the SD Card and phobe storage the available space is still 6.72GB, I already moved the apps to sc card from phone and still the same I cant download apps…please anyone???????????? to add some info regarding micro sd card is that u can store and save all your pics and videos sa sd card kasi un po ang default saving place kung saan ise save ng phone once u take pics or vids. Sarap Mall price nayan ung 4990 ? ? magkano po ang alcatel glory? oo nga paano ba mao turn off ang camera shutter? download file explorer den open den go to system den media den audio..hanapin mo ung file para sa camera shutter sound then delete it..
dapat po rooted phone mo para madelet mo ung mga files sa phone mo… lalo n ung system files. Yes kasama na access sa Google Play. There should be a pre-installed app for that. wala bang available na may secondary camera? mas prefer ko yun ehh..
pag na delete na ung mga system apps po…pde ba ibalik ulit sa original state ung phone ? wala ba tong mmrycard slot? if i take a picture, can i attach it in an email using wifi (thru the celfon)? yung sa corby kc ay nde raw pde makapag-attach sa email. kelangan ko ng celfon na makapag attach ng picture sa wifi email. tenks!!! hindi ba talaga pwede maalis ang shuttersound ng cam. nito? medyo kakahiya kse.. hai. hai. its better than galaxy y and battery life is longer than Lg and no lag ,but the internal memory is small cant save many apps , wish all the apps are movable to sd..
@3d1e64d18cac38dabdbb5a5417b9f888:disqus u can move apps to sd but u need to root your phone first..
your comparison is impressive.it has come to my decision to choose the glory. thanx a lot. nagpa renew ako sa sun plan ko kahapon at eto yong kinuha kong unit. maganda yong resolution niya kaso ang daming apps na nka installed. tanong ko lang pano ba to ma uninstall? di ko rin po alam yong rooting na yan hehe… atsaka nka download na ako ng GO apps super nice…. cheapest android nga eh dont expect more..xperia naghahang up..
Ang LG battery problem..hindi umaabot sa isang araw..
same specs except sa Camera and Processor. In my opinion, much better kung LG Optimus L3 na lang. Same Price. with 800MHz Processor compare to this with 650MHz Processor only. Php 5,990? Kung may ganun akong pera dadagdagan ko nalang. Php 6,500~6,000 ang price ng Xperia Mini which is 1GHz processor, 5MP Camera and 512MB RAM. I have to solve one problem before buying this. Saan makakabili ng hard case for protection? At paano kung sakaling masira ang charger o battery, can I find cheap replacements? just wanna ask how to install new apps using the SD Card… I have an 8gb kasi…. ok na ok tlga e2 kaso nakakainis ang daming application ang liit lng ng im.sayang d ko naman nagagamit wala na bang paraan para ma alis ung pre ins. application? Iroot mo sir phone mo para ma uninstall mo ang mga ibang appz. papaano po i-root?ask lang po hindi kasi ako techy eh..thanks..
dahil ky technobaboy naka decide ako na ito ang knuha kung plan..at yung samsung mabilis magluma tingnan mo ngayon ang galaxy y luma na..ilang months lang my lumalabas na na bago..
basahin nyo ang review makaka decide kayo…kung galaxy y ang plano mo mag alcatel kna lng same price pero ang features nla ecompare mo mas high quality ang alcatel glory..3mp,dual sim,same android. 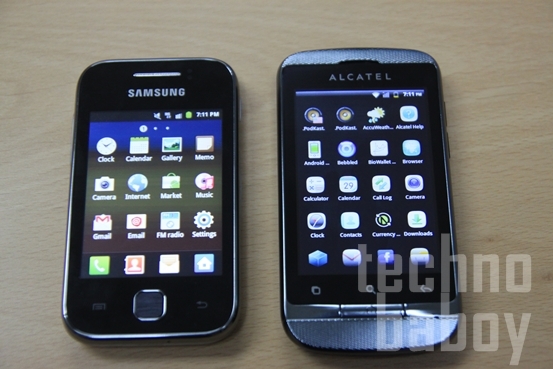 my galaxy y duos cla na pinalabas pero ang price 8990 same features lng naman ng alcatel glory. shuttesound lng ng camera problema ko.. sun postpaid ako. Best price with features of other smartphones! You get more of your money’s worth! Alcatel, keep it up! 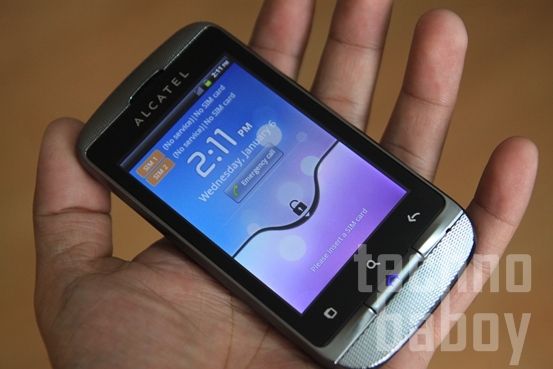 In this time the market of Alcatel is not so high.But i like Alcatel coz once i use it and i got good service. I wish it will be back with some great option and reasonable price. ask ko lng pareho lng ba yung 918n at 918d tnx. dinig ko me pagkakaiba pero, konti lang. nalilito nga ako kung same unit lang ba ang Glory 918N at Blaze Duo 918N. This review really helped me in picking a nice phone. So thanks for this review! And Btw, i got the phone and its AMAZING! nsa megamall aq ngaun kakasahOd lng. D2 aq s NetOpia pra basahin ung review d2 s technObabOy. Kahapon nagpunta n aq d2 tinanOng q ung saleslady abOut s feature ng fOne. Tas pinademo q s knya ung tunay na fOne. Ang ganda nmn ng features nia pati ung graphics. Walang2x wala ung Samsung Young na yan. Maicocompare q cia s Upper Samsung mOdels. Kaso khapOn nakacheke p ung sahOd q. So ngaun napaencash q n! ngaun P5600 n lng presyO nia d2 sa Megamall sa mgabilihan ng cell s taas. sir, pwede ba dito temple run? salamat po. Di pa po available ang Temple Run sa Android … pero maraming choices jan ..
may temple run po sa android, kaso hindi to supported nun due to low hardware specs. kaso no response naman sa mga nagtatanong. buti pa si yugatech! hmmmmp! im using it now, kakakuha ko lng sa sun..lov this phone…. how much sa plan ng sun to? 450? yeah, pero conditional yung application ko sa sun postpaid. kelangan daw e auto charj sa credit card ko yung plan ko na 350 per mo. me ganun? sapilitan? or else di aaprovan yung application ko. Hi. Just got this phone one week ago from Sun. Ok sya, I’m surprised na tumagal ng 2 whole days yung battery. Ang problem lang ay yung internal memory, maliit lang. Tapos ang daming preinstalled apps na di ko madelete. Pano po ba gawin yun na di mavo-void ang warranty? This is user-friendly kasi android sya, madami kang makukuhang tips sa internet. hi everyone….when i read the review above about this phone…i am partially persuaded…is this phone a friendly user?…kc pag sabi nla alcatel mahirap dw gamitin…ano ba talaga? i got already one week making my decision whether to buy or not on this phone…please help me technobaboy…. my alcatel store po ba sa iloilo?tanx po..
qwerty po ba ito pgnatxt ka? the best yung touchpal keyboard, ayusin mo lang yung settings ng language and keyboard.. para mas madali mag text, katulad din ng samsung. I just bought mine last week.I was looking for a phone that houses 2 sim cards as my previous one has 2. I was ready to get an Samsung or an IPhone before buying ALcatel Blaze, but I reconsidered as it will mean a 24mos.lock up period to a service provider and another monthly installment on the unit, and for me it seems a long time paying for this unit and it would mean using 1 sim only and another phone for the other. Inconvenience ! When I searched the internet, I came across this review and had second thoughts. It has the features I ‘m looking for in a phone. I liked the reviews and also, Samsung is all over the market (plus, I hate the idea of having so many people sharing the same phone) so I opted buying this. Now, for once I got what I wanted at a very affordable price. Very easy to download, clarity is very good and indeed, it has an easy grip feature, hindi sya madulas. Love this phone . As what the review said, battery will last if you use the applications sparingly. I suppose all android phones use up so much battery life anyway. For how much did you get it po? hi po..my alcatel store po kayo sa sm city iloilo? unfortunately hindi siya ma un-install built-in talaga siya. So ano po yung sabi ng isa ditong nagpost na pwedeng i-root? mga ka-unit, pa’no ko ba ma-install ang skype at ym? ask ko lng kapag ol kba makikita ba nila sa chatbox sa fb na ol ka? 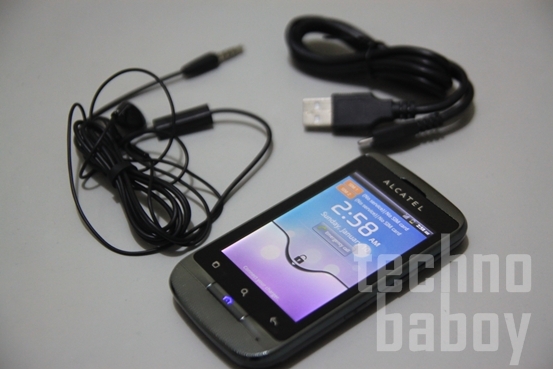 sa phone na ito…..
Alcatel Blaze Glory 918N I could definitely say this much better overall than SGY. For those who find the keyboard small for your fingertips. Try to download an app called Numberpad keyboard & set it as your default keypad. im really comparing the galaxy phone and diz alcatel, coz my dad and i are going to have are plan in SUN cell….can you gve me a reason y would i choose this phone plz…. Hi Technobaboy, I just want to know if the input keys for this can be changed from QWERTY to alphanumeric (i.e. traditional key input layout)? I don’t think 3.2″ screen is big enough for my hands to use QWERTY layout keys. the standard keyboard cannot be changed to alphanumeric. But I believe other apps from Google Play has this feature. I asked the sales lady if it can have alphanumeric keypad layout and she demoed it to me. I think she selected the keypad called “TouchPal” which was pre loaded in the phone (I am not sure if this is the case for all). After seeing that, I bought one (white) unit and now my wife is enjoying her new dual-sim phone. ang alam ko walng 20 hrs. amos un kasi sabi sa amin ng sun when i applied for that phone on the same plan..
Kakukuha ko lang ng sa akin sa SUN free phone for PLAN450. unli call and text sun2sun + 20 hrs internet a month. medyo nangangapa pa ako. sulit sana kung dual cam para YM at skype. bstat ung sim1 gamit dapat sun..
ang sabi, dual standby eh. Hi, nice review. Just want to ask if the screen is capacitive or resistive? ask ko lng po, kasi parang s CAMERA tska DISPLAY lamang n lamang ung 918n..
may nakapg root na ba sainyu? Asan na po ung sample shots ng camera?? haha. oo nga pala. will post them. love this phone, my problem is contacts. how do you move your contacts from sim card to phone? Go to Contacts, tapos press menu key sa left side tapos more sa more may import/export tapos yun na pili ka na ng source tapos destination.. COOL NA COOL…JUST BOUGHT ONE SA MEGA…. Help naman papano alisin mga phone bloatware. Love this phone. Was supposed to buy Galaxy Y pero it’s sold out. Good thing I found a poster of this unit. I managed to buy the last phone in stock sa mall near my house. san k nakabili??? puro out of stock kasi s SM North. thanks! Bought mine at SM Southmall, but the phone I got was also the last one during that time. That’s great! I bought mine for a higher price, though. Bakit kaya ganun? Pwede ba gamitin ang qwerty keyboard in landscape mode? wala kasi akong nakikitang pics showing that it is possible e.
Hi. I have the phone for a week now and yes, you can use QWERTY in landscape mode. wala bang video review nito?? where can I buy hard case or jelly case for this phone.. thanks! Since this is a new unit, I doubt there’s a jelly case available. Maybe next month pa.
Is the P5990 its permanent price or is it only the introductory price? I asked the woman behind the Alcatel stall and she said it’s a promo price, which means it will increase up to 8K or more after a few weeks ata. So I think now’s the right time to buy it while it’s still this cheap. Is there a multitouch function? pareho lng ba ung 918d at 918n? technobaboy i need your reps.
kc parang nabasa ko ung 918d pde palitan2 ng color case pero ung 918n hindi? 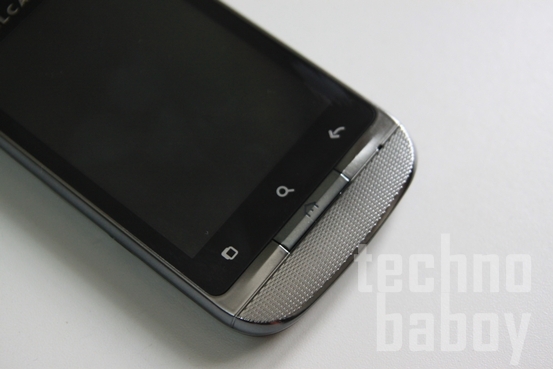 For potential Android users on a budget, this is easily a better buy than the Galaxy Y. A friend of mine just bought one of these and has his postpaid phone line as the second SIM. He plans to buy a Sun Broadband SIM with unlimited usage and load it as the phone’s primary SIM, to enjoy unlimited data at a cheaper price than if he got unlimited surfing with Globe or Smart. Lenovo A60 is much better. You wont have a problem sending sms from any of the sims while data is active. While for both dual sim alcatels (890D and this one) sms sending fails while data is active. And besides, Lenovo A60 already has a forum to support rooting, upgrade to ROMs et al.